Trying to impress the judges and reach the semi-final, keyboard players Dominic Degavino, Victor Lim, Yuanfan Yang, Adam Boeker and Martin Bartlett take to the stage. Clemency Burton-Hill presents highlights of the BBC Young Musician 2012 keyboard category final from the Royal Welsh College of Music and Drama in Cardiff. With behind-the-scenes access, it features all the news, profiles of the category finalists and extensive highlights from their performances. 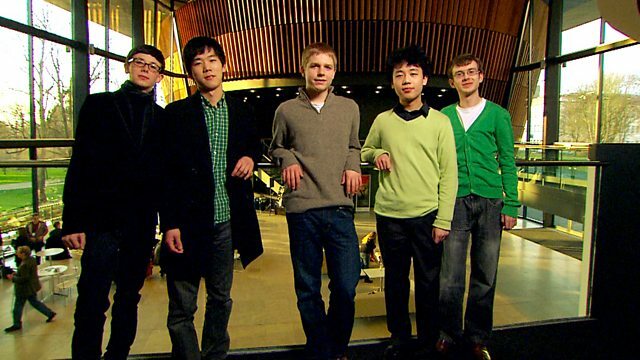 The five young pianists - 15-year-old Martin Bartlett, 18-year-old Victor Lim, 15-year-old Adam Boeker, 16-year-old Dominic Degavino and 15-year-old Yuanfan Yang - give some remarkable performances, with a diverse repertoire that includes works by Dutilleux, Chopin, Scarlatti and even a competitor's self-penned composition. Each of them are determined to impress the judges to win the category, which will gain them that all-important place in the semi-final and a shot at the BBC Young Musician 2012 title.